Ever since Polka King lost his polka bachelorhood, his sightings have been as rare as proper elevator etiquette at Crystal Mall. How does one get out of an elevator if you all rush in? I digress... Anyways, when he indicated that he and Polka Dot were able to join us for eats after hockey, I had to ensure that it would be a place that could suit mini-Polka Dot (yah, we've seen him even less since she was born). So we ended up a the old location of Los Compadres, which now stands another Japanese restaurant in North Burnaby. In fact, only a few steps from Yo Sushi. Starting with the Assorted Sashimi, the portion size was pretty decent for the price ($12.95). 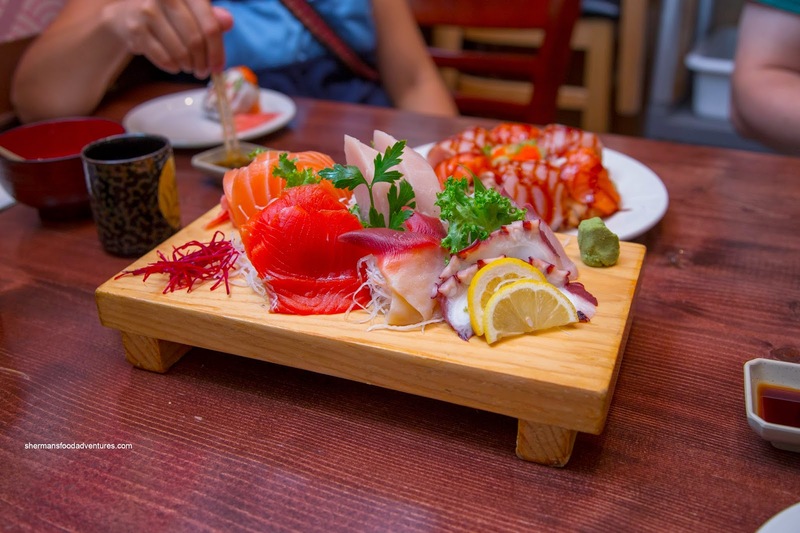 It consisted of 2 pieces each of hamachi, hokkigai, tako, tuna, Atlantic salmon and Sockeye salmon. Everything seemed to be on point except I found the Sockeye a bit too soft for my liking. It didn't taste bad though. For our roll, Mihouse chose the Monkey's Tears which had cream cheese in it. Normally, I can't stand cream cheese in any maki sushi. However, it was masked by the plentiful ingredients. There was just a small ring of rice on the outside. It was seasoned, but strangely salty. Ginseng insisted we try the Sushi Pizza and in reality, it was only a pizza in name only. I tried to pick it up with hand and it was an epic fail with things flying everywhere. 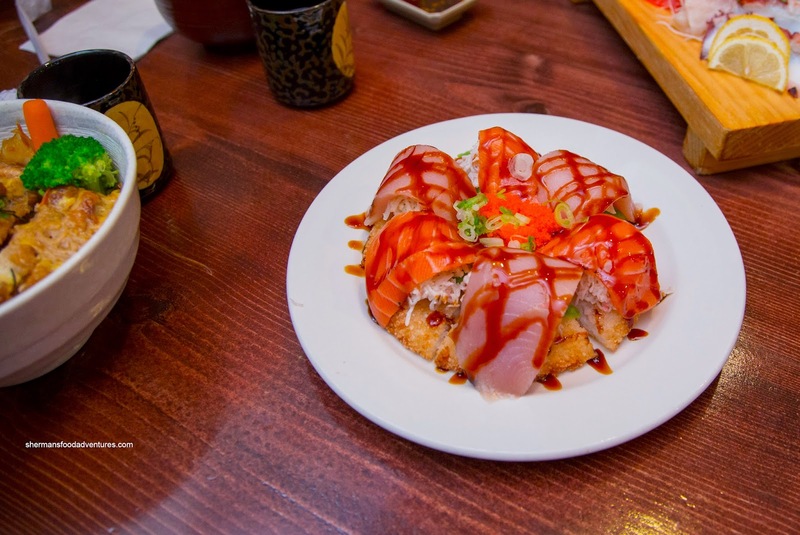 Sitting atop the fried rice patty was imitation crab, either tuna or salmon and tobiko. I found the fried rice to have a firm crunch while the ample amount of imitation crab ensured some saltiness. The slices of fish were really large and were sauced with a somewhat spicy glaze. 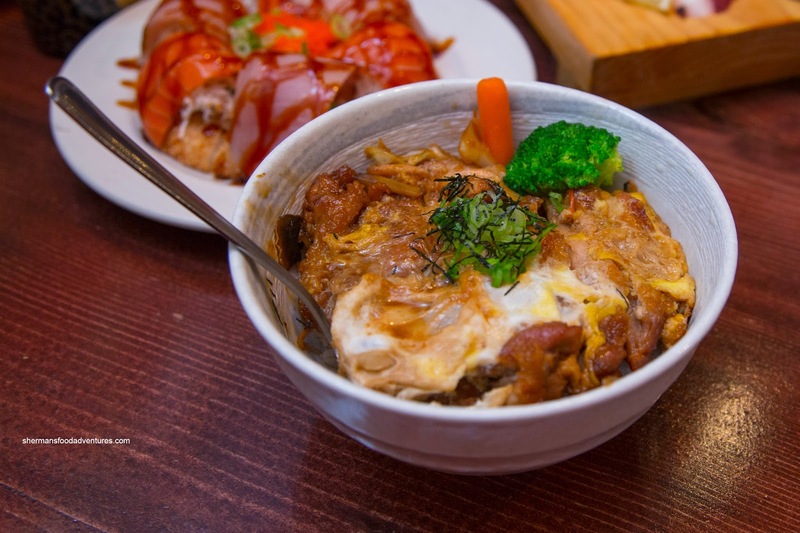 We also had the Oyako Don which was topped with fried pieces of chicken. They were a bit too dry for my tastes, yet were seasoned well. The rice was chewy and benefited from the seepage of sauce from the top. 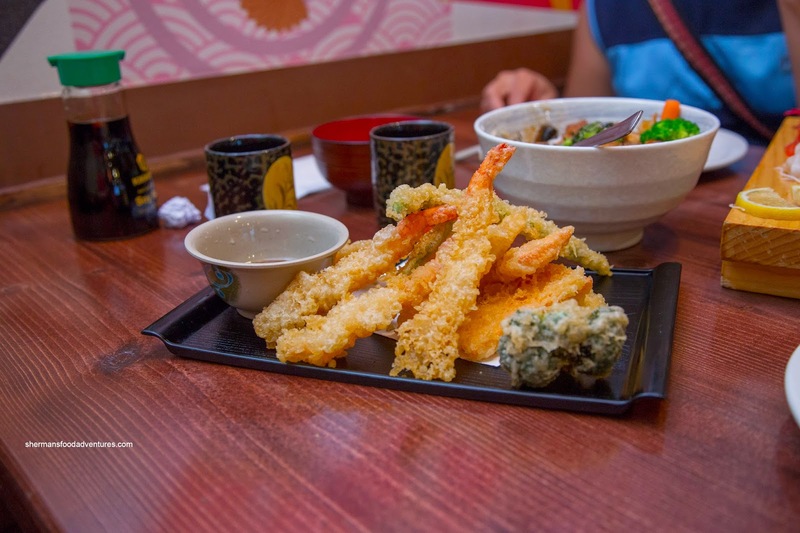 Lastly, we had the Assorted Tempura which arrived in a darker shade of golden. Despite this, it wasn't overly greasy nor heavy. The batter was light and crispy while the veggies were not overdone. As for the ebi, they were buttery soft with some bite. 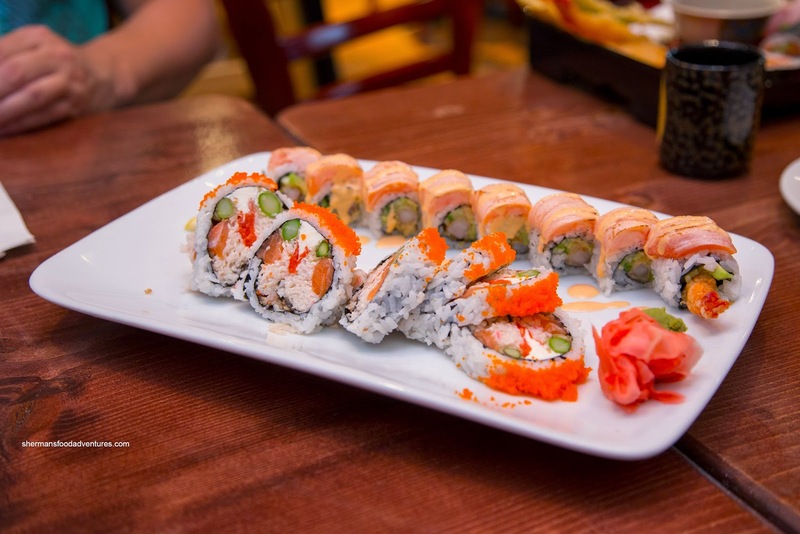 Considering the pricing and the portion size, we were satisfied with our meal at Sushi UOmo. 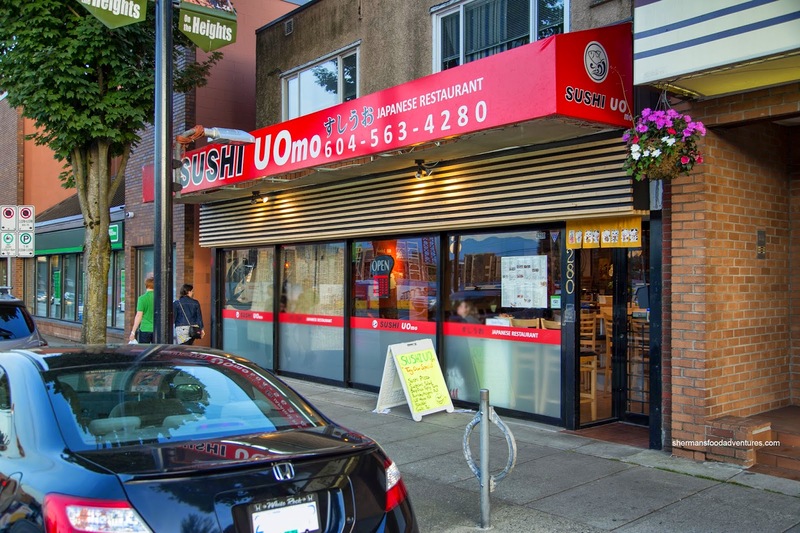 Although, we wouldn't necessarily drive from afar to eat at Sushi UOmo, it does do the job, especially for those in the neighbourhood. We found it better than the other place a few stores down. It seems that Sushi UOmo has made some refinements since I last tried it in June. Interestingly enough, I can't stand cream cheese in my maki sushi too!